Alongside the reveal of Microsoft Windows 10 S and the Surface Laptop yesterday at the #MicrosoftEDU Event another appealing piece of computer hardware was shown to the public for the first time. Microsoft has evolved and refined its well regarded wireless Arc Touch Mouse and will release the Microsoft Surface Arc Mouse alongside the Surface Laptop on 15th June. Microsoft launched the Arc Touch Mouse back in 2010. Its portability was enhanced by a wireless flexible body design, and it looked rather cool and futuristic at the time, though it was itself an evolution of the foldable Arc Mouse from 2008. Back to the future and the new Microsoft Surface Arc Mouse removes any visual indicators of separate active zones upon its touch surface. The front face is now effectively a large touch pad and can be used for all the functions you are likely to be accustomed to in modern Windows. The touch surface still registers and feeds-back left and right clicks but now the whole of the mouse front surface is capable of recognising scrolling actions and gestures from your fingers. 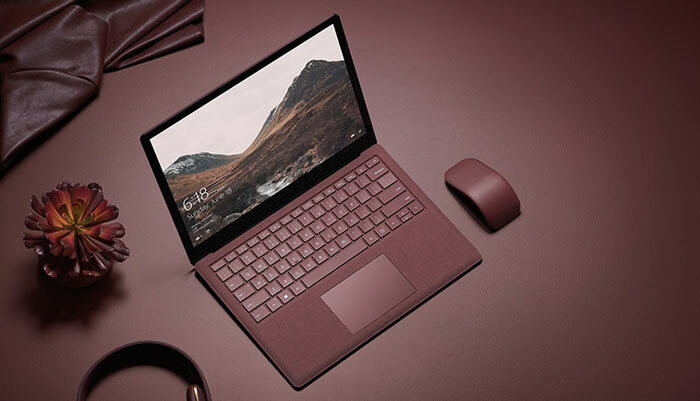 Microsoft's Surface Arc Mouse is going to be made available in a trio of shades made to complement/match the new Surface Laptop; light grey, cobalt blue, and burgundy. The grey one is neutral enough to match many PC systems but a black one would have been welcome too. The new mouse if pre-orderable today in the US at $79.99 and will ship from the same date the Surface Laptop becomes available, the 15th June. (I can't find it listed on the UK site though the Surface Laptop UK store page is live). Maybe they didn't build enough to meet global demand and decided to soft launch the product in the US? AFAIK wasn't the first one a bit s#it? i tried it once in ashop and it didn't impress me ergonomics wise.